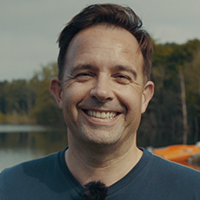 Get triathlon ready with Triathlon Coach Simon Sharp's top tips to outdoors swimming. Triathlon swimming is not for the faint-hearted. When you’re out on the water you’ll meet all kinds of challenges you wouldn’t on any other swim. Not being able to see the bottom or to stand up can lead to you becoming disorientated, not swimming in a straight line, and swallowing water. You’ll also be in the water with potentially hundreds of competitors invading your space and buffeting you around. On top of this, the cold water you experience in the UK can lead to an ‘ice cream headache’. It’s tough, but it’s rewarding, and I’m going to teach you how to get through it. You might think that starting is just about getting in the water, but there’s a bit of a science to it. There are two regular starts to a triathlon: the first is a beach start where you all start on the bank and jostle to get into the water when the horn blows; the second is a floating start, where you begin already in the water. The beach start can give you a good running start, but it can be hectic and congested.You may find it harder to pick up pace with a floating start but it's easier to find a space and get stuck in. Where you position yourself for both of these entries can make all the difference. Work out your route and try to get as close to the side of the group that is closest to your path. You don't want to get stuck in the middle of the group where you risk being hurt. Once you’re in the water, it’s important you stay calm and control your breathing. Use bilateral breathing (breathing on both sides) and make sure you fully exhale and relax into the swim. One of the biggest challenges during a busy triathlon is sighting & navigation. Unlike pool swimming you won't be able to follow any lane markings to keep straight and you'll be surrounded by other people blocking your view. The best thing to do is to research the course - is it going clockwise or anticlockwise; do you have to get out and back into the water; how many buoys are there; where are the turning points? Knowing where you're going in advance will help you to avoid one of the most common mistakes - following other competitors. They might not know where they are going. But being in a crowd has its benefits too. Drafting is a technique that will help you ride the slipstream of your competitors to conserve energy. To draft, you want to sit either right on the feet of one of your competitors or right on their hip. This will allow you to minimise your own efforts. This technique also has its downsides. Get too close and you could get a foot in the face, so weigh this up before you decide to do it. One thing that can throw triathlon swimmers is the turn. Buoys can get very congested so I'd always suggest taking a nice wide turn and avoiding the bustle, this should allow you avoid injury. Put in an extra hard kick for about 10 to 20 meters to maintain your pace on the turn. Once you’ve mastered these techniques, the last thing to conquer is exiting the water. On the last leg make sure you are looking and sighting where you are coming out of the water so that you can take the most direct and clear route. And in the last 100 - 200m put in an extra hard kick so that you warm up your legs in preparation for the cycle ahead. Whether it’s your first triathlon or not, you should always do at least one practice swim outdoors in an environment similar to the location you’ll be competing in. Get used to swimming outdoors, practice these techniques and you’ll be well on your way to triathlon success. 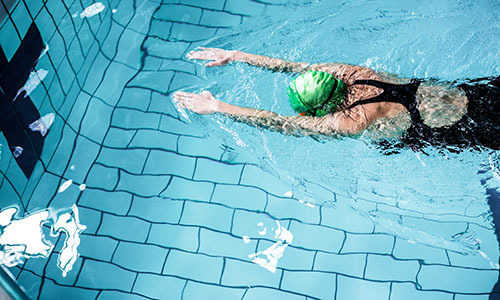 Evolve your pool routine with this training programme from Swim Manager Jessica Mitchell. 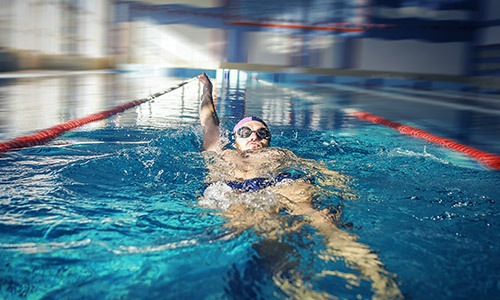 Introduce some variety into your swimming pool routine with this beginner training plan from Swim Manager Jessica Mitchell.